Genghis Khan Statue in Mangolia. The statue of great king of Mangol empire locate in Mangolia. In Mangolia on the Bank of river Tuul at Tsonjin Boldog statue located. The place which comes to the east of Manolian capital Ullanbaatar. Who was Genghis Khan ? If you are good at your school education then you may have listen word in History about Genghis Khan. 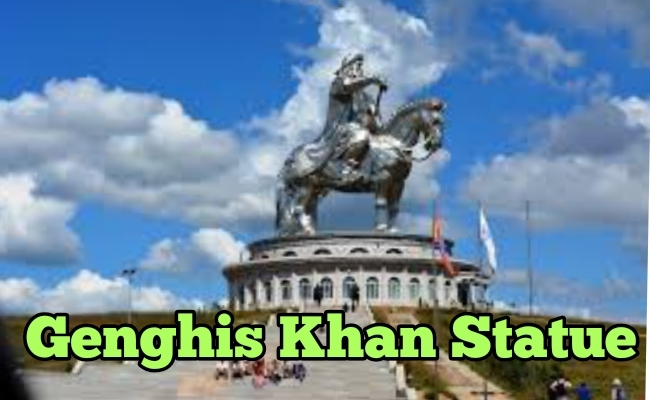 Genghis Khan name in many country also pronounced as Chengez Khan or Chengiz Khan. He was born in 1662 near, lake Baikal in Mangolia and died 18 August, 1227. Chengiz Khan is most famous conquerered King of History. He first gathered nomadic tribes people. Unified them under his leadership. After that he started to expand his empire in Asia and Adriatic Sea. Chengez Khan also decreed the adoption of Uyghurs script. the Mangol empire writting system at that time. He also participated in meritocracy and encouraged religious tolerance in his Empire. One of the harsh reality of Genghis Khan was notorious for his brutality. He used to butality compaign against opposition. The King was a genocide ruler by many historians. He use to kill foe If cought by Mangol army instead of giving any chance. That is brief history of Genghis Khan. In this article our motto to discuss on Genghis Khan Statue. We hope you got Information about it.